The curious black-capped chickadee is the most common chickadee in North America, with a widespread range and familiar appearance. Its distinctive calls are also easy to identify, making this bird a popular one for birders developing their birding by ear skills. Markings: Genders are similar with a thick, well-defined black cap that extends just to the bottom of the eye and contrasts with bright white cheeks. The chin and throat are also black. The back is light gray or olive-gray, and the wings are gray with white edging and a whitewash on the shoulder. The black tail has white edges that are most visible in flight. The chest and upper abdomen are grayish white, while there is a variable buff wash on the flanks and lower abdomen. Juveniles look similar to adults but their colors and markings are generally less defined, and the tail is often shorter. Black-capped chickadees are year-round residents of boreal, deciduous and mixed forests as well as riparian areas below the tundra line throughout Alaska and Canada. Their southern range extends to Washington, Oregon, Idaho, Utah, Colorado, Nebraska, Iowa, Michigan, Pennsylvania and New Jersey, with small populations even further south in the upper elevations of the Appalachian Mountains. When food sources are limited in northern regions, these birds may irrupt far south of their typical range, though otherwise, they do not typically migrate. The black-capped chickadee’s most familiar call is the raspy, even “chick-a-dee-dee-dee” for which it was named. Other calls and songs include a piercing, 3-4 syllable whistle, a rapid “ti-ti-ti-ti-ti-ti” call and “feeee-bee” or “feeee-bee-bee” calls. These are perky, curious birds with hyperactive energy. They forage in trees and shrubs, often clinging upside down to pluck insects from underneath leaves. Very sociable, they are often found in small flocks throughout the year and in larger mixed flocks with juncos, nuthatches, titmice, kinglets and other small birds in winter. Black-capped chickadees regularly cache food in thousands of locations, and they have a remarkable memory for their food storage, returning to caches weeks later if necessary. When feeding, they demonstrate a complex flock hierarchy with dominant birds feeding first, particularly at feeders. They are unlikely to linger at feeders, however, and typically grab a seed quickly before flying off with it. Black-capped chickadees are monogamous birds. Both partners work together to excavate a nesting cavity and line it with bits of leaves, grass, moss, fur, feathers and similar materials. Cavities may be located 5-40 feet above the ground, and these birds will readily use birdhouses of the appropriate size. A mated pair will produce one brood of 5-9 oval-shaped eggs each year. The eggs are white or pale buff with fine red-brown spots, usually concentrated at the larger end. Both birds incubate the nest for 11-13 days, and the altricial young will remain in the nest with the female parent for 14-18 days after hatching. A black-capped chickadee is often one of the first birds to discover a new feeder, and they are common backyard visitors, particularly in winter. Birders who offer suet, peanuts, peanut butter, and black oil sunflower seeds or hulled sunflower seeds will see these birds regularly. Individual birds may even become tame enough to be hand-fed. Black-capped chickadees can be encouraged to nest in birdhouses with sawdust or wood shavings in the bottom, and birders can attract them in the field by pishing. While these widespread birds are not considered threatened or endangered, they are still at risk from habitat loss, particularly in northern areas where logging operations can decimate forests. 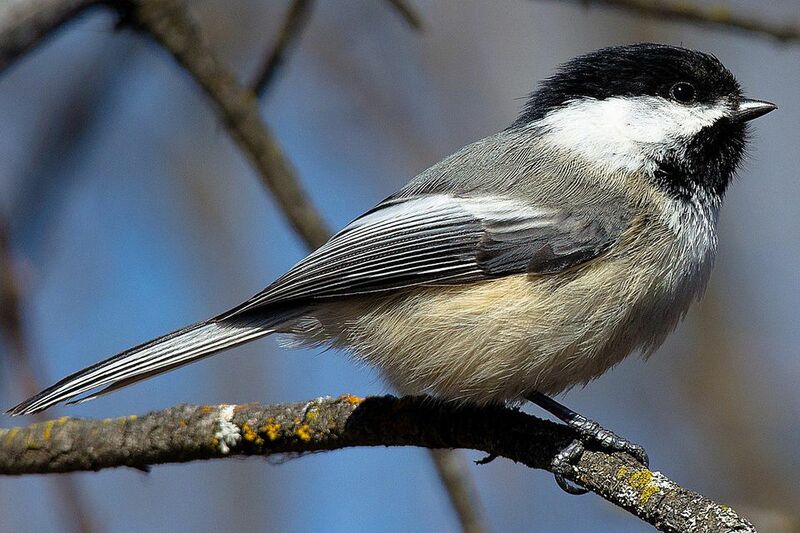 They are adaptable to urban settings, however, and encouraging mature trees and preserving snags for nesting are great steps to help protect black-capped chickadees. Feral cats and outdoor cats are also grave threats to these birds, and backyard birders should take all appropriate steps to remove cats from their yard if chickadees are regular guests.